Sometimes The Best Gifts Aren’t Objects, They Are Experiences! Climbing and Zip-lining Gift Cards! Gift Cards are available for purchase online! Gift cards may be redeemed for admission online or via phone and do not expire. For reference, tickets cost $49/person (ages 7-11) and $57/person (ages 12+). The TreeTop 10-Pack allows you to purchase 10 tickets for $46/ticket for a total of $460 (a $570 value!). Tickets are transferable to friends and family and must be used within 1 year of the purchase date. 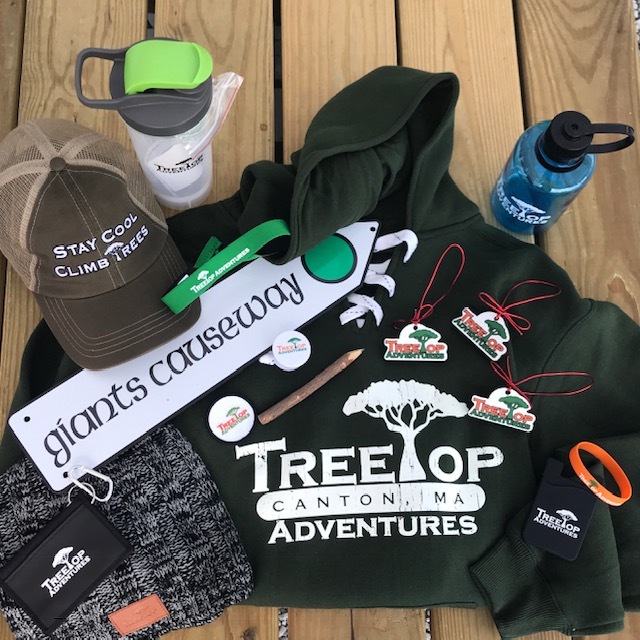 Turn your gift into an “Epic Adventure” Gift Basket by pairing a Gift Card or TreeTop 10-Pack with some of our awesome TreeTop Adventures Swag. We have Sweatshirts, water bottles, hats, “favorite trail” signs, ornaments & more! Perfect for avid climbers and active families! Our unlimited individual climbing passes allow the pass holder to climb weekly or even daily throughout our season whenever we are open to the public (approximately 150 days)! New this year- For each season pass membership purchased, receive (2) FREE passes (a $112 value) and (6) 50% off tickets- bring your friends and family for a day of zip-line and climbing fun!